Project Option 1: Create this 18″ X 36″ farmhouse style sign to hang in the room you gather in the most. Photo Credit: BurmaBoutique Etsy Shop. Project supplies include: One precut 18″ X 36″ board, two precut 18″ trim pieces, 2 precut 36″ trim pieces, liquid nails, white and black paint/paint pens/sharpies, sandpaper, and “gather” stencil. 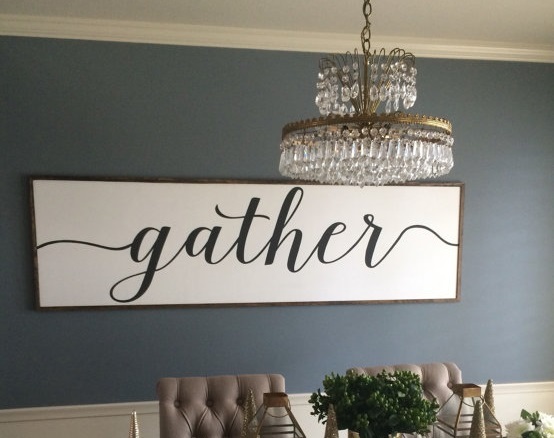 Register for August’s Gather Farmhouse Style Sign, “Thankful” Barnwood Sign or Wooden Mason Jar Centerpiece. RSVPs and cancellations for this craft are due by Wednesday, August 2 so we have enough supplies. If you need to cancel after this date, please let us know and we will email you an invoice and set up a time for you to pick up a kit. *$1 added for Square Invoice/Credit Card payment. Project supplies include: Four precut 5.5 X 16″ tongue and groove boards, one precut 5.5 X 16″ fence board, nails, plywood, and keyhole fasteners. Variety of paint and stains to choose from. Variety of pre-purchased words OR you can purchase/bring your own word. Total project length is 25″ wide by 16″ tall. Project supplies include: One precut 13″ (1 X 6″) board, two precut 13″ (1 X 3″) boards, 2 precut 4″ (1 X 3″) boards, nails, three wide mouth quart mason jars, and two handles. Choose from a variety of handles, paints, chalk paints and stains. 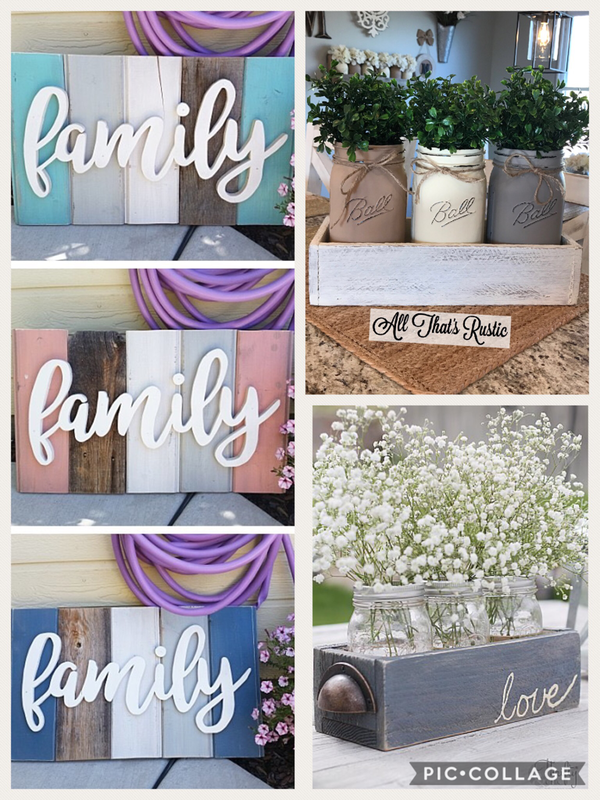 Register for July’s Barnwood Sign or Wooden Mason Jar Centerpiece. RSVPs and cancellations for this craft are due by Wednesday, July 19 so we have enough supplies. If you need to cancel after this date, please let us know and we will email you an invoice and set up a time for you to pick up a kit.